A tree between two houses can often provide an extra level of privacy for both sides of the fence or at a minimum a better view than a neighbor’s window. While a tree between you and the house next door can have some benefits, it can create problems if that tree becomes diseased, damaged, or weakened. Trees can become dangerous for a number of reasons such as disease, insect or pest infestation, fungus, rot, damaged or broken branches, root weakness, and leaning. When unaddressed, these issues and among others can lead to property damage, personal injury to you or loved ones, and can even affect the health of surrounding trees or landscaping. A tree showing signs that it needs to be cut down should be carefully monitored and quickly removed, preferably with the help of a professional tree removal company. A damaged tree can cause a number of problems even when it is out on its own in a big yard, but when its nestled between two homes it can put both properties at risk. A dead or damaged tree puts both houses in jeopardy of branches falling onto them or even the whole tree falling over. At the very least, a damaged tree can lean on a fence or even push it over. Branches that fall on a house could potentially break windows, cause roof damage, rip off gutters, scrape exterior walls, or worse fall on a person standing near by. If the whole tree fell over, the level of damage or injury to each individual property would be so much greater. If the tree is large enough it could cause structural damage to more than just the roof and could even lead to plumbing issues. 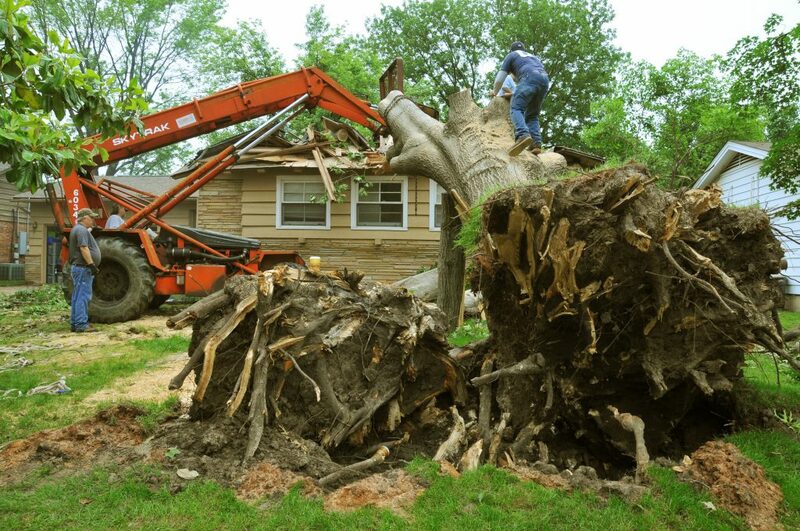 If the tree is technically on your property, you will be held responsible for not only the damage to your home, but also for the damage to your neighbor’s home. If the tree is straddling property lines, it could cause more than property damage, it could also result in a conflicting and stressful situation between you and your neighbor. If a tree between you and the home next door is showing signs of weakness, decay or if the tree is dead, the most important thing you can do is to act quickly and have the tree removed as soon as possible, especially if there is not much room between the two houses. Removing a tree is not an easy task when there is nothing in the surrounding area, but it becomes significantly more complicated when there isn’t much room to maneuver. If the proper precautions are not taken or the proper cuts made, the tree could fall on either houses and even cause damage to both houses regardless of which direction it falls. The best way to cut down a tree between two houses is to hire a professional and experienced tree removal company. Nevada Tree Service in Las Vegas, NV has provided superior tree service since 1962 and has the experience needed to remove a tree regardless of its surroundings. If your tree is putting your house and that of someone else’s at risk, don’t attempt to remove it yourself. You will only increase the risk of damage to the properties and create a serious risk of injuring yourself or anyone nearby. Before the tree can cause a costly problem or serious injury, call Nevada Tree Service at (702) 433-4700. Trees are definitely the source of natural beauty and freshness in your home space. However, at times they grow up in inappropriate areas such as a construction sites. 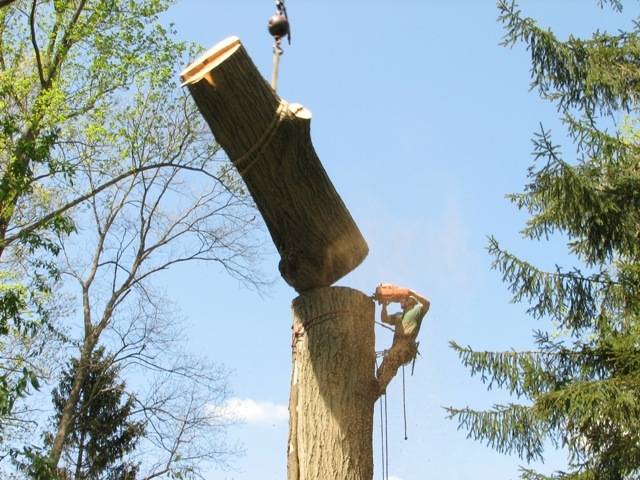 Removing a tree can become really complicated at times even for the tree removing services. These services are well equipped with professional tools and methods that can ease out the process. Tree has its roots spread wide across the larger section of the ground and if it has grown really big, then the equal amount of effort is required to remove it. 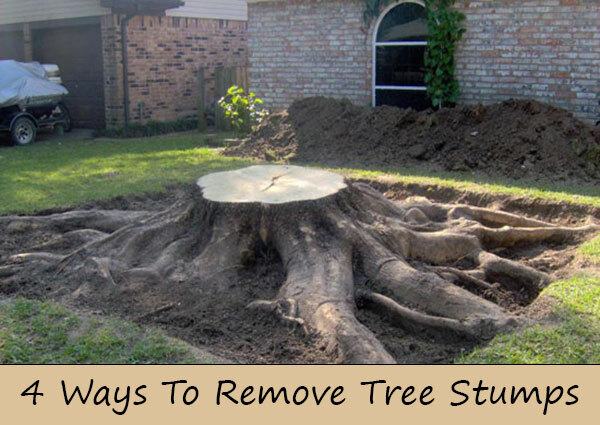 In this post, we are going to discuss few tips that can help you efficiently while removing the tree. It might be possible that you can keep the tree and instead trim it. Often, it has been found that people fall in complexities of maintaining the tree and finally decide to remove it to avoid the hassles. In such cases, the tree removal is not among the suggested choices. If the tree has occupied the perfect space, what can be better than that? Take the help of some tree trimming service or you can also do it on you own. For this, you would require some mastery over the climbing and balancing. This can be little difficult at first but if you find it really tough, make a call and ask for the professional’s help. It is very important to protect you, your family and neighbours during the tree removal. It is possible that unknowingly, you might face a hit. Try to evacuate the area and suggest the same to other people who stay nearby till the process lasts. This can help prevent hazardous situations. 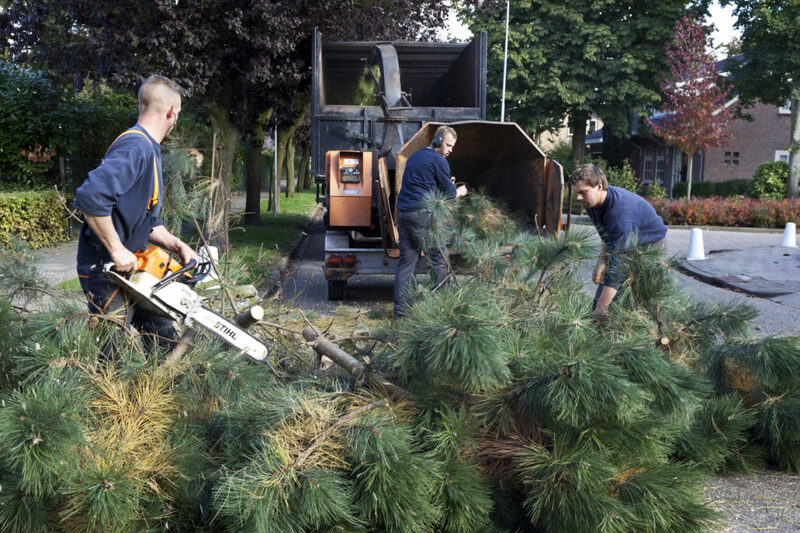 A tree removal service is well aware of all the facts and operations that would be required to tackle such situations. If you are somehow engaged in the process, wear safety gears like hard shell vests, respirators, protective eye glasses, impact gloves and hard pants with boots. Do you know how to safely care for and remove trees? While trees can add value to your home, shade, and in some instances even food, they can also pose a risk if not cared for properly. In the event that you do need help with tree services, we at Nevada Tree Service are here to help. With reliable and experienced professionals, we can perform even the toughest jobs out there. Tree Location – Is there a tree too close to your home? Is it causing cracks in your walls or the foundations of your home? If a tree is not removed, it can cause serious damage to your home, which could be extremely costly if not addressed quickly. Tree Health – Dead trees can pose various risks for damage, especially in the event that they fall. Also, in some instances, trees can be sick, which can translate into damage to the rest of your landscaping. If this is the case, removing the tree is always the best course of action. Tree Debris – Do you have a tree that is always filling your yard with leaves and dead branches? 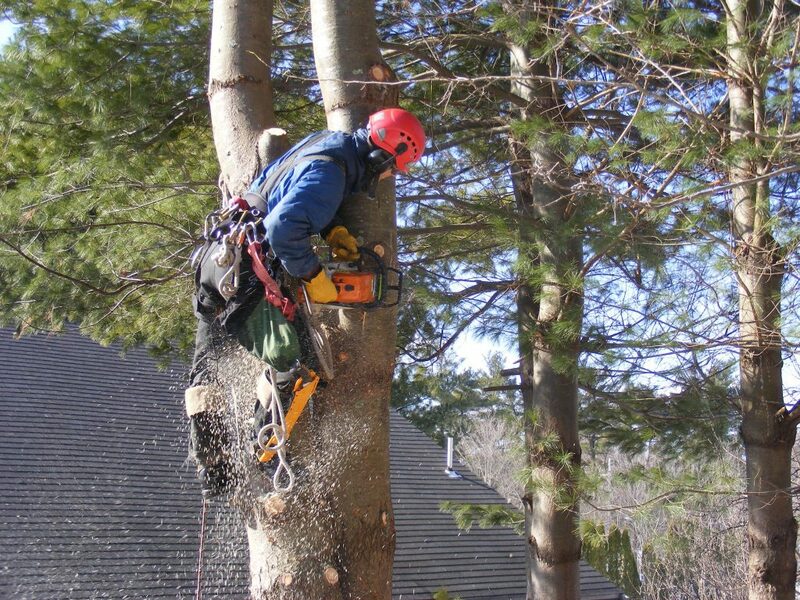 At Nevada Tree Service we understand that some trees cause more work than needed. If this is the case, we can remove the tree and assist in finding a better alternative that is perfect for your yard. What are the Benefits of Tree Service? Part of being a homeowner is properly carrying for your landscaping. When it comes to trees in your yard, that includes tree care, tree trimming, root pruning, and many more services that we at Nevada Tree Service provide. Some of the benefits you will enjoy with regular tree service include a nicer looking yard, longer lasting trees and landscaping, improved shade and look, as well as a general increase of the value of your home. If these sound like the benefits you would enjoy, be sure to give us a call for service in your area! Are you looking for reliable tree removal and care services in the Las Vegas area? We at Nevada Tree Service are the top in the field of tree removal, care and maintenance ensuring the safety and beauty of your home! No one wants unsightly or potentially damaging trees taking up valuable space in their yard. Rather than risk injury to yourself or your property, a good step is to partner with a specialist in tree removal services. The convenience and quality work offered by a professional in tree care can save you not only time, but resources as well. Tree stump removal: Tree stumps can be an eyesore in your yard and serve no real purpose. There are several options when it comes to removing a stump, including grinding it down, applying a chemical, or pulling it out from the roots. A trained professional in tree care can present the best course of action for removal of these nuisances. Trees have died: A dead tree is not only unattractive, but has the potential to cause damage. Brittle wood can cause branches or limbs to fall on power lines, vehicles, and people. It is better to take care of the issue now rather than risk injury to your family or property. Tree removal services specialize in evaluating the situation and mapping out the best course of action for the homeowner’s need. Trees are causing damage: When a tree is planted close to structures like homes, outbuildings, and pools, they can begin to cause damage to the property. As the roots come up from the ground, they can lift concrete, creep into underground sewer systems, and even break walls. The solution may lie in pruning the roots or eliminating the issue by removing the tree. Care must be taken during this process to protect the property and the surrounding area. No matter what issues trees may be causing in your yard, there are solutions available that are practical and affordable. When you partner with a professional in tree removal services like Nevada Tree, you can be sure you will receive the best advice and quality work that will remedy the situation and get your yard back to normal. Unsightly tree stumps can be pesky and inconvenient yard ornaments, and doing the work to remove them may seem daunting. Whether you do the work yourself or rely on a specialist in tree removal, there are solutions for getting rid of these nuisances. Here are four ways to remove tree stumps from your yard. s in tree removal to get the job done. The machine works to grind the surface of tree stumps, all the way to the roots. Burning: This method may seem like the simplest, since you avoid throwing chemicals on the stump and you can save strain on your back. First, contact the local fire department to make sure there are no restrictions for open fires in your area. After you have the go-ahead, lay cut wood on top of the stump and surround it with more wood. Let the fire burn for several hours, then clean out the ash and replace with sawdust. Digging: Using a shovel, dig around the stump to expose the roots as much as possible. Use a root saw to chop the roots into pieces and pull out what you are able with a grub hoe. When all the roots are removed, pull up the stump, using a shovel if necessary. Fill the hole with sawdust, adding to it as the material sinks down. Chemicals: Special chemicals, which can be secured through retailers who are knowledgeable about tree removal, are designed to break up stumps and make them easier to remove. Drill a series of holes on the top surface of the stump, spacing them evenly.Apply the chemical remover, being sure to keep kids and pets away from the area. It may take several weeks for tree stumps to soften and begin to rot, and after this time can be chopped with a shovel or ax. Whatever method you decide on, be sure to practice safety first. Wear proper eye wear, protective gloves, and keep the area safe from kids. When in doubt, contact a trusted and professional company like Nevada Tree to handle the job.